Don’t be put off by the title. 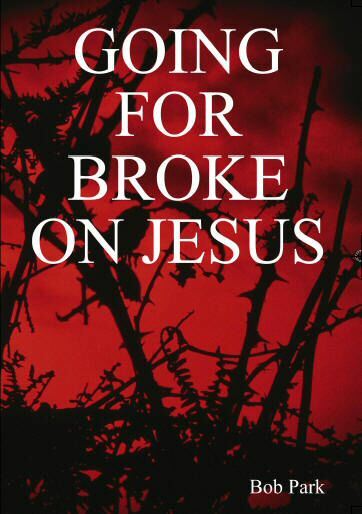 “Going for Broke on Jesus” is not a religious book in as much as stained glass windows, high church and ceremony is concerned. It is the true moving story of how a Glaswegian’s childlike faith in Jesus restored a broken home and turned beer bottles into furniture. Bob Park was brought up in a Glasgow slum. He left school aged fourteen and served a five year apprenticeship as a Painter and Decorator before joining the Scots Guards on duty at Buckingham Palace. On leaving the Scots Guards he was a Prison Officer at Barlinnie Prison, Glasgow then a Police Officer. He left the Police and ended up in the gutter through alcohol abuse. In the early nineties Bob founded the U.K. registered charity ROM-Aid International through which he transported some £12,000,000 (twelve million) of humanitarian aid to Romania over a sixteen year period. This resulted in the building of a new 'Accident & Emergency Department' for a local run down hospital, a 'Christian Community Centre' and a 'Hospice' for terminally ill HIV infected children. free postage from this web site. and I’ll be happy to send you a signed copy. My name is Bob Park, I am married to Anne and we have one boy and two girls. I was born top flat 62 Lambhill Street, Kinning Park on 5th August 1939.in Glasgow, Scotland just before the war. Brought up in a slum, two rooms housing my mum, dad, three brothers and one sister . Our neighborhood suffered bombing from the German war planes and many were killed. My family moved to Priesthill when I was about 11 yrs old. A Stage play has been written about Bob's book.
" I've finished reading this book and I thoroughly enjoyed it. It is written in a nice easy-flowing style, with contributions from his wife, which I thought was most appropriate. How she managed to stick by him, I'll never know!! Whether you enjoy it or not may depend on whether you have faith or not. However, at the end of this read, you can have nothing but admiration for the author, who not only turned his life around but went on to use his life to help others." Stephen Callaghan, a respected playwright from Glasgow wrote a stage play based on Bob's book. 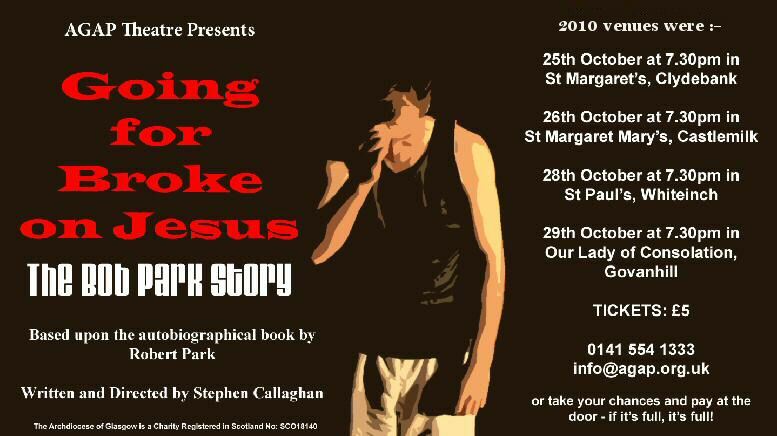 The first four performances of the play were performed in Glasgow during October 2010.. Stephen is Director of the Archdiocese of Glasgow Arts Project and is based at St Michael's RC Church, 1350 Gallowgate, Glasgow. He is creative Director for AGAP Theatre of the same address and his work is presented at LentFest and Arts in Autumn both of which he also directs and presents. His work has been shown in all the media including television.